FORT LAUDERDALE, Fla. (Feb. 22, 2012) -- Budget cuts for the Department of Defense and the Army will likely play a prominent role in discussions, panels and presentations at this year's Association of the United States Army's winter event here, leaders indicated. The opening speaker for the event was Gen. Ann E. Dunwoody, commander of Army Materiel Command. "This year is even more important, because this is such a critical time for our Army," she said. 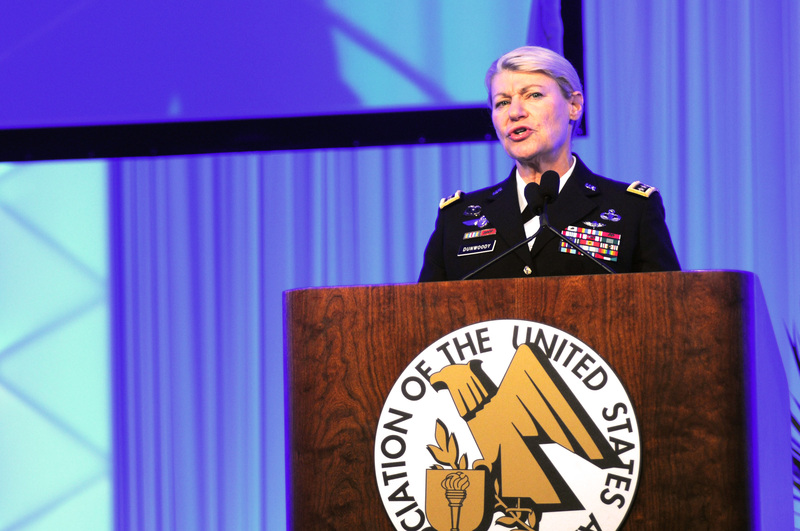 During the opening presentation at the 2012 Association of the United States Army's Institute of Land Warfare Winter Symposium and Exposition in Fort Lauderdale, Fla., Gen. Ann E. Dunwoody, commander, Army Material Command, discussed the "inconvenient truth," that is the budget reductions that come following a conflict. In 37 years of service, she said she's never seen a time when as much change has come as quickly, including the drawdowns and the change in military budgets. When 2011 came to a close, she said, there was uncertainty about the budget and the way ahead for both Army and the Department of Defense. An "inconvenient truth," she said, is the budget reduction that comes following a conflict. "We all knew we were going to face the same historic budget reductions we've seen at the end of every conflict," Dunwoody said. "We've all seen the second and third-order effects of not getting it right," she said. "Task Force Smith before Korea and the hollow Army after Vietnam, we can't let that happen again." Citing Chairman of the Joints Chiefs of Staff Gen. Martin E. Dempsey, she said dealing with budget issues facing both the DOD and the Army will mean "getting after the ends, ways and means." "We all know and expected our means would go down. But our ends really haven't changed," she said. "We will still be counted on to respond to full-spectrum operations and win. A dip in the budget is not going to give anyone a pass on what our nation expects us to do. So when the means don't meet your ends, you have one choice left, and that's to get after the ways." She said the Army must fundamentally change the way it does business: "we must find ways to adapt. And institutional adaptation is not just a budget drill." In the past two and a half months, Dunwoody said, there have been answers to questions about both budget and the way ahead for the Department of Defense and the Army. Included in that is a new DOD strategy, followed three weeks later by the secretary of Defense's budget priorities. Dunwoody said it was notable the two documents came in that order. "How many times have we seen the budget released before the strategy," she asked. Later, she said, Dempsey released the strategic direction to the joint force. "It talks about the need to balance ends, ways and means," Dunwoody said. "It speaks to the logic behind the tough choices we're making." Last Friday, the new Army posture statement for 2012 was released. "One of the things it highlights is the absolute requirement for institutional adaptation, including logistics and acquisition," Dunwoody said. And Army Chief of Staff Gen. Raymond T. Odierno recently released his "marching orders" to the Army. All those important documents, Dunwoody said, share some reoccurring themes, including "the need to be bold, adaptive and innovative." At the AUSA winter symposium and exposition, Army leaders will discuss how the service will demonstrate boldness, adaptiveness and innovation. Heidi Shyu, the principal deputy assistant secretary of the Army for acquisition, logistics and technology, will discuss how the Army will provide Soldiers with the decisive advantage that comes from versatile and affordable equipment. Lt. Gen. Dennis Via, the deputy commanding general of AMC, will discuss retrograde and reset. Lt. Gen. Keith Walker, deputy commanding general for Army futures, and the director of the Army Capabilities Integration Center, U.S. Army Training and Doctrine Command, will chair a panel on Army investment strategies. And Lt. Gen. Raymond Mason, deputy chief of staff, G-4, will chair a panel on operational energy. The Association of the United States Army's Institute of Land Warfare winter symposium and exposition runs Feb. 22-24 in Fort Lauderdale, Fla.